It runs on any machine supporting Java 5 or later; special versions are released for Mac OS X and Windows. The cross-platform nature is important for students who have a variety of home/dorm computer systems. The drawing interface is based on an intuitive toolbar. Color-coded wires aid in simulating and debugging a circuit. The wiring tool draws horizontal and vertical wires, automatically connecting to components and to other wires. It’s very easy to draw circuits! Completed circuits can be saved into a file, exported to a GIF file, or printed on a printer. 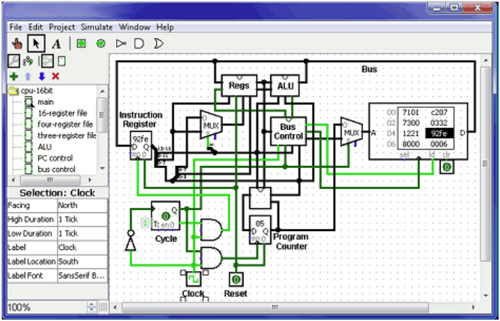 Circuit layouts can be used as “sub circuits” of other circuits, allowing for hierarchical circuit design. Included circuit components include inputs and outputs, gates, multiplexers, arithmetic circuits, flip-flops, and RAM memory. The included “combinational analysis” module allows for conversion between circuits, truth tables, and Boolean expressions.